Sydney Shop Girl: Books and Leaves: Backlogs Cleared. Leafy Thursdays seem to be rolling around at the speed of light these days. It always seems to be around May when the year officially begins to race away from me. Work travel, the organised chaos of winter at work and before you know it, Christmas will be here again... But I'm getting ahead of myself. Speaking of light, it may be speedy but it's also looking rather special in Sydney at the moment. I'm loving the soft golden blue of our days right now. Looking out the window and walking down our street today were probably the things that gave me my up and go today. It was a bit of a rough night with work and once I get that just after midnight call, I find it really hard to get back to sleep. So then I sleep in and then that leaves me feeling a little seedy. Oh well, it comes with the territory. The good that came out of my sleepless night was that I managed to get through the last of my outstanding reads. Unfortunately, that was outstanding as in not yet finished reading. The couple of books I've been struggling to finish yet felt compelled to see them through to the bitter end for different reasons. 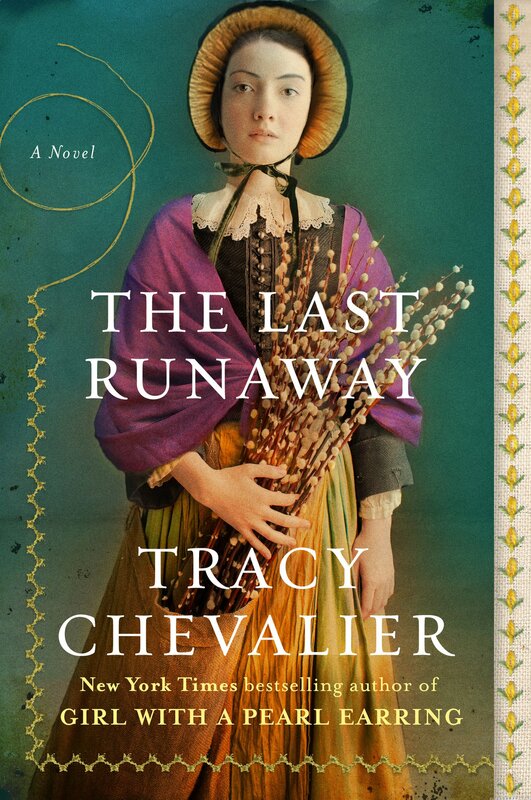 'The Last Runaway' by Tracey Chevalier was outstanding because Chevalier is a favourite author of mine and I would have felt both guilty and disloyal if I hadn't finished the novel. 'The Last Runaway' is the story of Honor Bright, a young Quaker from England who finds herself resettled in the newly established Quaker community in Ohio after a series of tragic events see her lose first her fiancé and then her sister. Honor's life and happiness now becomes dependent on the people who at times appear to have no more in common with her than their religion which itself seems to be practiced a little different in the New World than it is back home in Dorset. The major cultural and political theme against which Honor's life unfolds in 'The Last Runaway' is the sorry chapter of American history in the form of slavery. Honor becomes an advocate for 'runaways' in the only way a woman in her position could - by sheltering, hiding and feeding them. As her own life becomes more oppressed and her own personality stifled, Honor begins to relate to the 'runaways' in a way she would not otherwise have if perhaps she'd stayed in Dorset in the bosom of her family and her faith. Something in Honor changes and she too finds herself running away. I agree with The Guardian review I linked to earlier. It wasn't Chevalier's best novel and I found the minor characters more engaging and interesting than Honor herself. The examination of the historical context of Honor's life was fascinating and vividly recreated in the novel but otherwise, it wasn't one of those books that I felt really brought history alive for me. I read 'The Danish Girl' on the strength of the beautiful film adaptation. The film and its actors were a formidable combination and I found it hard to read Ebershoff's novel without constantly harking back to my memories of the film. Because of how complete the film felt to me, reading the novel then seemed like too much hard work. Greta (played by Alicia Vikander) and Einar (played by Eddie Redmayne) looked so beautiful together that I almost couldn't bear to read about the heartbreak Greta felt at the 'death' of her husband and the almost selfish way he then carried on as Lili with her hopes of marrying her lover in New York after all her surgeries were completed. But I did it. Finished both the novels at last. No more Kindle downloading guilt for me. Preschooler SSG and I eased into the day, enjoying a bask in the sun and mid morning cafe run. The slow start to the day must have worked because by the afternoon, I was actually looking forward to tackling the mountain of leaves that seem to have descended upon us since last week. We worked away for an hour sweeping, leaf gathering and generally enjoying being outdoors and well away from screens, the printed word or writing implements. And it did us both a world of good. This has started. The invasion of the kitchen floor by trains and train tracks. Preschooler SSG built this circuit all on his own and the back end even snakes under the sofa. Lego won't be too far away. The painful looking normal sized stuff. I'd better start planning footwear options for when the house does become a temple of devotion to the world of Lego. Cheerio and gee I'm stoked it's Friday tomorrow!